Once in a while I get lucky at the store and find an unusual vegetable I’ve never tried. 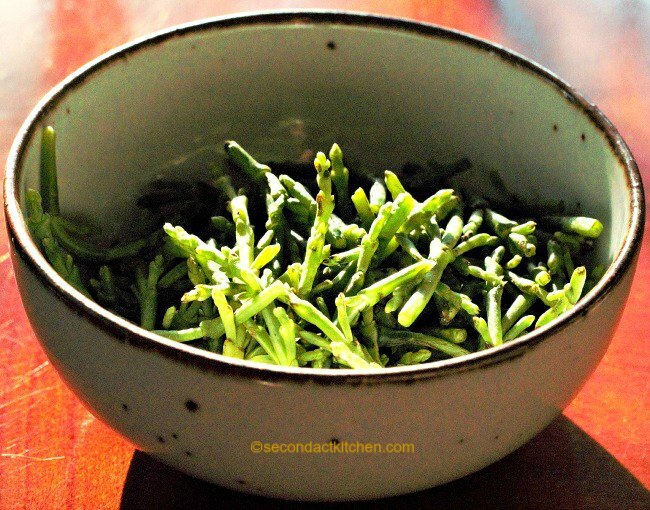 This week was one of those weeks when I came across sea beans which are also called sea asparagus, glasswort and saltwort in various places around the world. When I saw these little beauties, I had to buy them and bring them home. So I did. The next challenge was to figure out what to do with them. You can eat them raw, although they are very salty, or you can eat them cooked, but they can become limp and unappealing. So I decided to follow the advice given to me by the produce guy at the market who suggested I blanch them briefly in boiling water, and follow up with a quick ice bath to chill them down and help them retain their color and crispness. In terms of their nutritional composition, sea beans are mostly water and carbohydrate and 100 g of sea beans contains around 30 calories and 1660 mg sodium (Source: Lu, et al. in Hortscience Vol. 36(3), 2001, p. 484). Sea beans grow irrigated by salty seawater which gives them their high sodium content. As a result, you want to use them in small quantities as more of an accent for a dish, rather than as the main event. 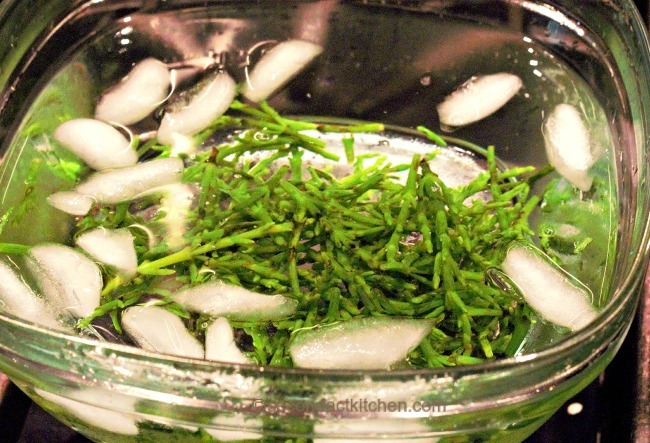 Blanching them first also helps remove a little sodium. 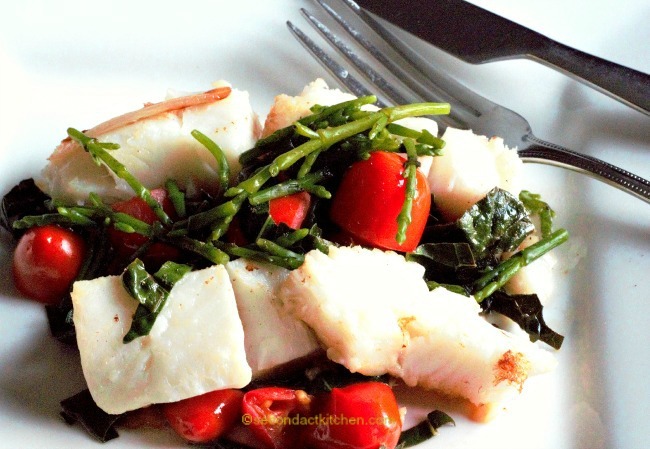 High sodium or not, I decided the best way to use this new vegetable was to put it with turbot, kale and tomatoes in a simple sauce made with Japanese cooking wine, some lemon juice, and noextra salt. Blanch sea beans in boiling water for 1-2 minutes. Place in ice bath to stop the cooking process and retain crispness. 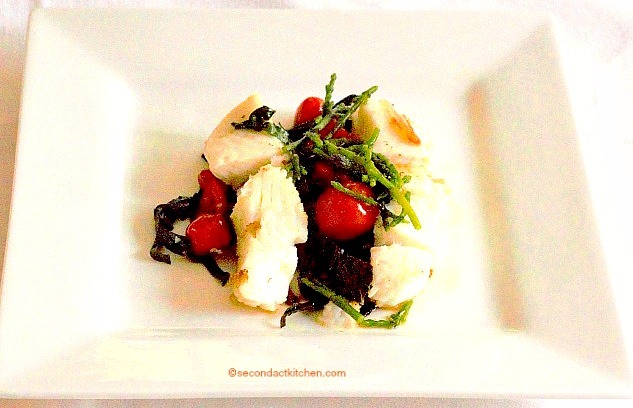 Slice turbot into 1 1/2″ servings. Spray a large skillet with canola oil. Saute onions on high for 3-5 minutes. Place turbot in pan, cover and cook for 5 minutes. Turn to low heat. Add kale, tomatoes, rice wine and lemon juice. Continue to cook covered until fish is done. Season with pepper. Serve the fish surrounded by the vegetables from the pan. Just before serving, top each serving with a small accent of blanched sea beans. Approximate nutrition information per serving: 150 calories; 3.5 grams fat; 1 gram saturated fat; 0 grams transfat; 55 mg cholesterol; 650 mg sodium; 5 grams carbohydrate; 1 gram dietary fiber; 19 grams protein.